The yard at Denver's Burnham shops have seen more than a few engines these days as Union Pacific held an auction of more than 50 units on July 14, 2010.  Earlier in the month, a request came in from the Colorado Railroad Museum. Would it be possible, they asked, for UP to donate unit UP 9871? Within hours, UP said yes! A vintage 1980 former-Denver & Rio Grande Western diesel-electric "Tunnel Motor" is no small favor! These locomotives were the premier, heavy-diesel power for the Class 1 D&RGW railroad, representing the ultimate in locomotive development. They were among the last new locos purchased by the Rio Grande. The locomotive is over 70 ft. long and weighs nearly 350,000 lbs. 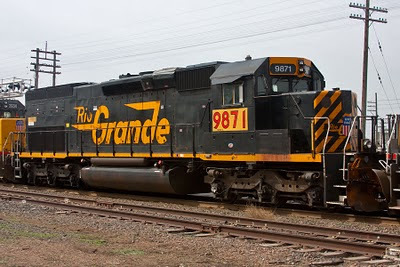 The museum already has a diesel from the Rio Grande, the 5771. Actually, they have three. The 5771 has a sister behind her, #5762. Additionally, there is a GP-30, DRGW 3011 sitting behind the roundhouse awaiting funds for restoration. Nonetheless, the museum is thrilled. "This is a significant addition to the collection of Museum locomotives," said Donald Tallman, Executive Director of the Colorado Railroad Museum. " 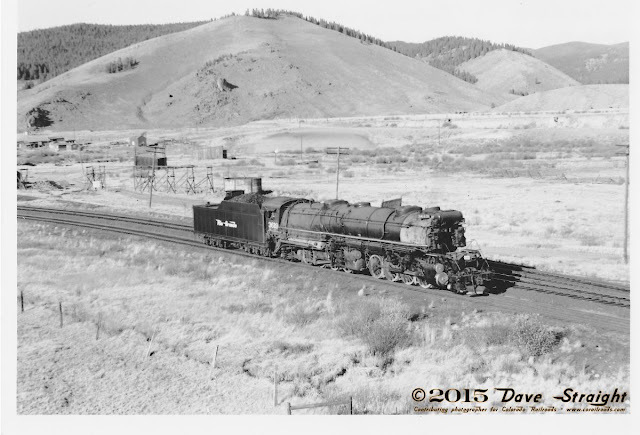 The Museum now has among the first [in the 1881-built steam engine #346] and last of the D&RGW locomotives that worked in Colorado." 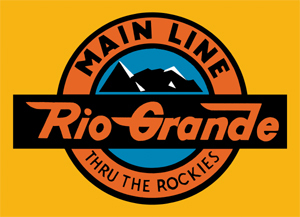 Indeed, the Colorado Railroad Museum now has quite the ultimate in Rio Grande motive power. #346 - a working, fire-breathing steam locomotive they use at many of the museum steam-ups, the C-19 consolidation was purchased by museum founder Robert W. Richardson in 1950. Originating in 1881, she was D&RG 406, before the corporation incorporated as D&RGW(estern). #583 - a cold C-28, in fact, the only surviving standard gauge Rio Grande engine of any vintage from the tiny 4-6-0s to the mighty 2-8-8-2 articulated's that shook the mountains with the thunder of their passing. The museum has her numbered as she was originally with the Denver & Rio Grande (later renumbered to 683 under the D&RGW). It's ironic that the engine likely will never see steam again. For time out of mind, she has been the first engine visitors see when entering the museum grounds from the building. 3011 GP-30 Built in 1962, she's a good example of early road switchers in their second generation. She was donated by OmniTrax in 1994 Amazingly, several of her sisters work on in various small shortline jobs. SHe's sitting back behind the roundhouse, waiting for her time to come. Could the advent of the tunnel motor donation summon her from her weed-strewn environs? Does #50 really count? A diesel narrow gauge that worked on the Sumpter Valley, the Rio Grande, Roaring Camp & Big Trees and the Durango & Silverton. It's a shop engine to shove things around when a steam engine isn't handy. Pitiful, just pitiful. 5401 SD40T-2 - Main Line Thru the Rockies power, built for growling up the grades to near timberline and then back down with dynamic brakes and retainers. Accordingg to both James Griffin and UtahRails.net, the unit was renumbered (patched) to UP 8594 on June 30, 2005. 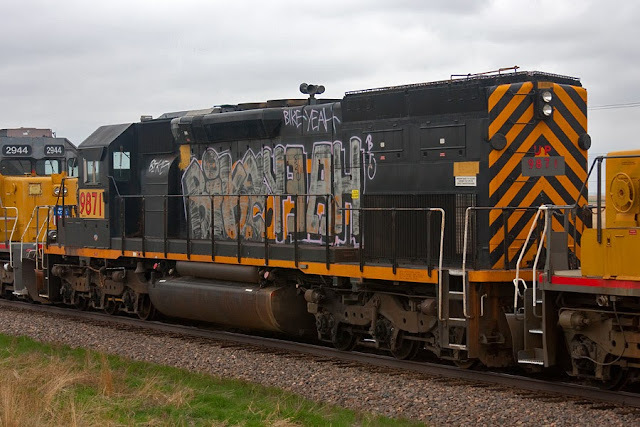 Further, according to Kevin Morgan, intrepid photographer, UP 8594 was renumbered again to UP 9871 on June 1, 2007. Two patchings and no painting by the boys in Armour Yellow, we should count ourselves lucky, right? He was also able to catch it from the reverse angle, which reveals a heinous spate of graffiti. Fortunately, he managed to catch 5401 in happier times. So was Nathan Holmes on DRGW.net. Not to be left out, these people did too. Still, did the Museum folks know about the "unofficial" paint job on the conductor's side? "Yes indeed," Donald Tallman told me in an e-mail yesterday. "However, it was more originally intact than the other unit we were considering." And, after all, it's just paint. Keeping everything intact is most important to a museum. Paint is easy to match, buy and apply. A specialized piece of equipment or one that's prone to theft is not so easy to redo. With the donation, what will happen to the engine while the museum raises the funds to move it to the property? 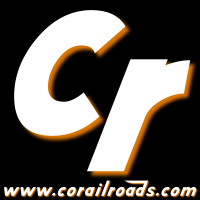 Tallman said, "The BNSF has agreed to transport the locomotive to MillerCoors, where it will be stored temporarily until a suitable display track can be built and the Museum can find the funding to move it to the site." Tallman added that if someone would like to make a donation to this project, contact donald@crrm.org. DRG&W (UP 9871) still sits on Coors Property as of today. Any updates of when or how they will move it to the museum property? I may try to photograph it at some point.